Thu., Aug. 30, 2018, 10:46 a.m.
Amazon, in a rare public response to outside criticism, posted a blog on Wednesday broadly sticking up for the pay and benefits packages and working conditions in its warehouse network. Pay, the company said, averages $15 an hour when bonuses and grants of Amazon stock are included, and the company offers health care and other benefits to full-time hourly warehouse workers. Amazon’s blog said the company had been in regular contact with Sanders’ office and had invited the independent senator and his staff to tour a fulfillment center, as Amazon calls its warehouses. Sanders’ office issued its own lengthy statement Wednesday, doubling down on the critique of the company and saying Amazon had not been able to accommodate the senator’s request for a tour during a trip to Wisconsin last month. Sanders had recently posted a request online for Amazon workers to share their experience at the company and asked them to highlight in particular whether they had to use public assistance while on Amazon’s payroll. The senator plans to introduce a bill soon that would tax large employers like Amazon a sum equal to the value of the federal assistance – like food stamps, public housing and Medicaid – that their employees receive, in a bid to encourage companies to raise the standard of living of their workers. New Food Economy, a nonprofit news website, reported earlier this year that thousands of Amazon employees in several states relied on the government’s Supplemental Nutritional Assistance Program, formerly called food stamps. Amazon is the second-largest private-sector employer in the U.S., after Walmart, and employed about 575,000 people worldwide at the end of June. Amazon’s statement said the tally of its employees receiving food assistance was misleading, as it includes part-time and temporary workers. Dave Clark, who oversees Amazon’s logistics work as senior vice president of worldwide operations, sent leaders in that group an email Wednesday encouraging them to ask employees to share their own experiences with the senator. He posted a similar message on Twitter. The company recently began paying employees to do just that, enlisting workers in a new program to proactively respond to questions about and criticism of the company’s warehouses on Twitter and other social-media sites. Those employees, which Amazon calls ambassadors, are free to comment from their personal experience, Amazon says. Their views of the company have been uniformly positive, with many citing some of the same talking points about pay and benefits that Amazon made in its blog on Wednesday. Amazon has been criticized for years for working conditions at its warehouse and distribution network, which includes more than 100 facilities in dozens of states. Media reports have found rigorous and physically demanding work-rate quotas in facilities that weren’t always climate controlled, and, in some instances, little time for bathroom breaks. The company, which in recent years has hired tens of thousands of warehouse workers in a booming economy, has ramped up its effort to portray the facilities in a good light, offering public tours and highlighting the perks it offers employees there, including a program that offers to pay almost all of the cost of training for better-paying, in-demand jobs in other sectors. 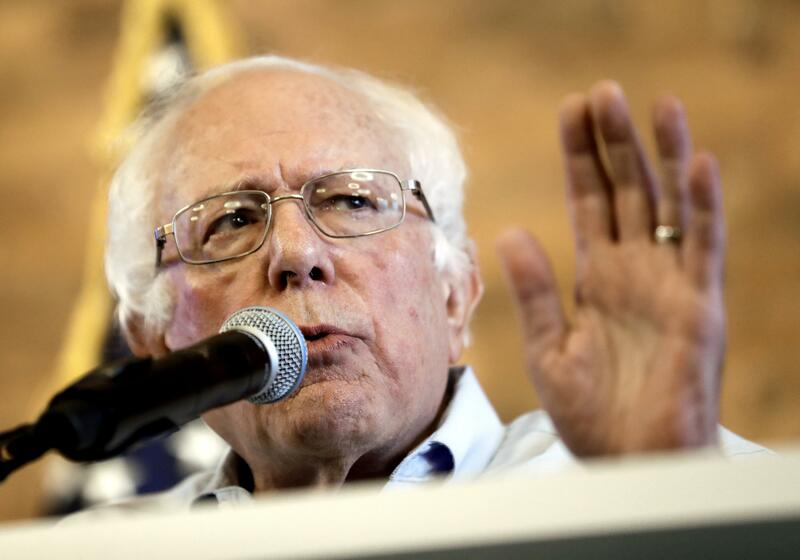 Sanders’ critiques have also suggested that Amazon Chief Executive Jeff Bezos, who became the world’s richest man because of the strong market performance of his roughly 16 percent ownership stake in Amazon shares, could afford to pay his employees more. One of Sanders’ tweets noted that, at the rate Bezos’ wealth has climbed this year with Amazon’s stock gains, he has made more than Amazon’s roughly $28,000 median annual wage every 10 seconds. The Bloomberg Billionaires Index pegs Bezos’s wealth at $159 billion. “All over this country, many Amazon employees, who work for the wealthiest person on Earth, are paid wages so low they can’t make ends meet,” Sanders’ statement on Wednesday said. Amazon’s response to Sanders stands in contrast to the company’s typical practice of silence after President Donald Trump took to Twitter at various points this year to slam Bezos and the company. Published: Aug. 30, 2018, 10:46 a.m.